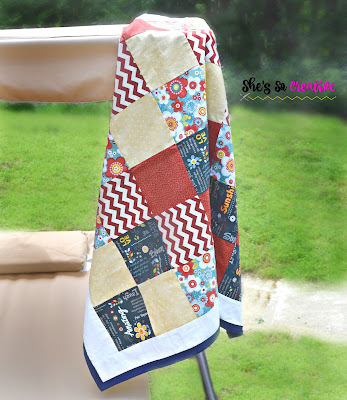 I absolutely adore quilts! I especially love the final product possibilities! This post contains affiliate links. By purchasing through the affiliate links provided, I will receive a small commission for bringing you the link. This is at no extra cost to you! I also love how they can be made by any skill level, from beginner to expert! My first quilt was the Modern Log Cabin Quilt. It was easy to make, but still just a step above beginner level. 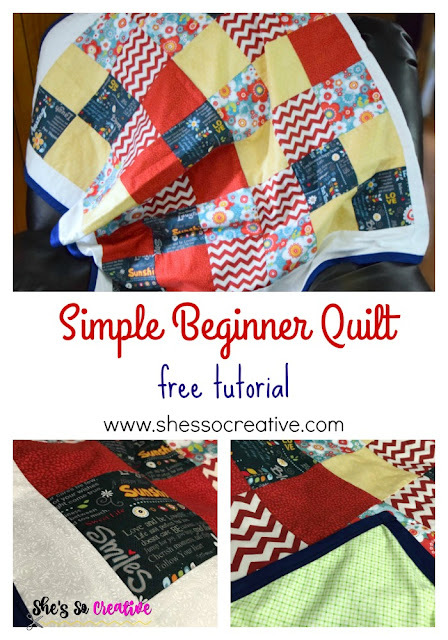 I quickly decided I would need to make a beginner friendly quilt tutorial at some point. My great grandmother made me a quilt when I was a baby. 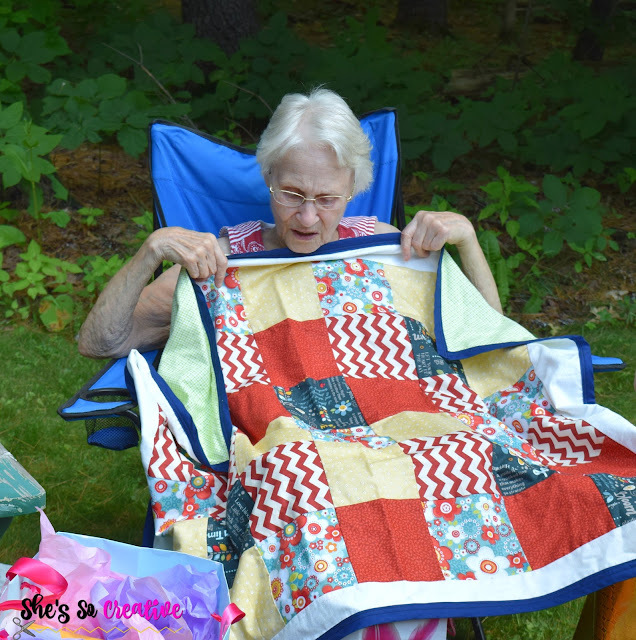 It was a simple two piece quilt, that she made by hand. How great is that?! So, when my Nana's birthday came around, I thought a quilt inspired by one her mother made for me would be sweet. Her birthday is at the beginning of July, when it's super hot too, so an easy two piece lightweight quilt was perfect! 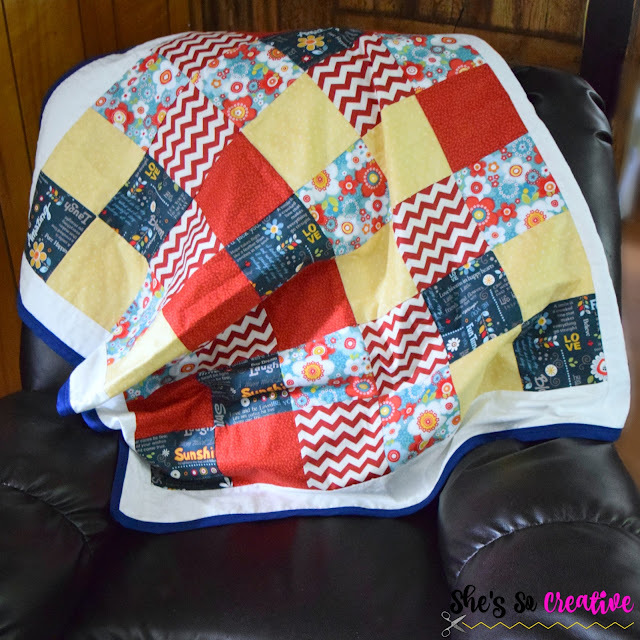 This quilt is really easy, quick, and takes little materials! 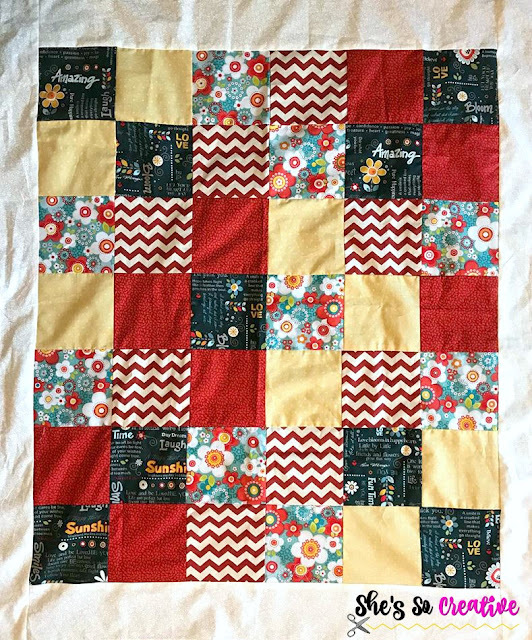 Seriously the best quilt to make for your first time! 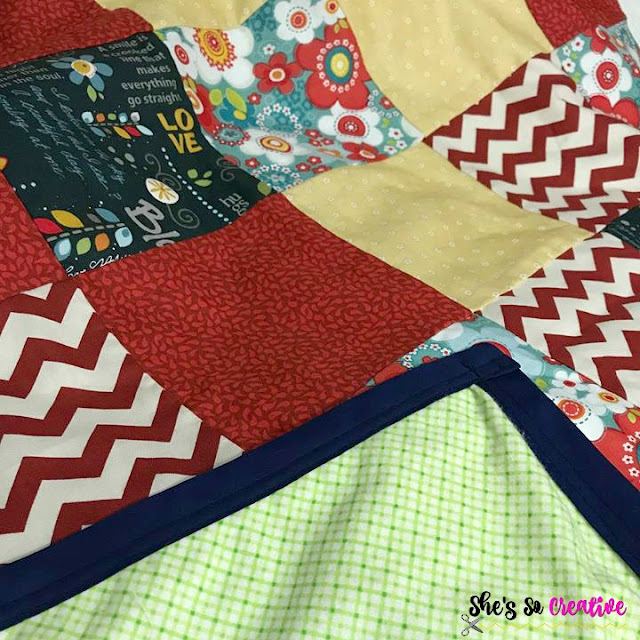 For this tutorial is instructions for a lapghan/baby size quilt, but you can easily adjust this by adding more squares to the top panel and then measuring top to bottom and side to side to determine how large of a backing you will need. Note: My fat quarters were purchased from ADORNit, but the rest of my materials came from Joann Fabric and Crafts. Cut Fabric F into 2 - 33" x 4.5" strips and 2 - 38" x 3.5" strips = set aside. Take two 6" squares, hold them print sides together, and sew up one side. 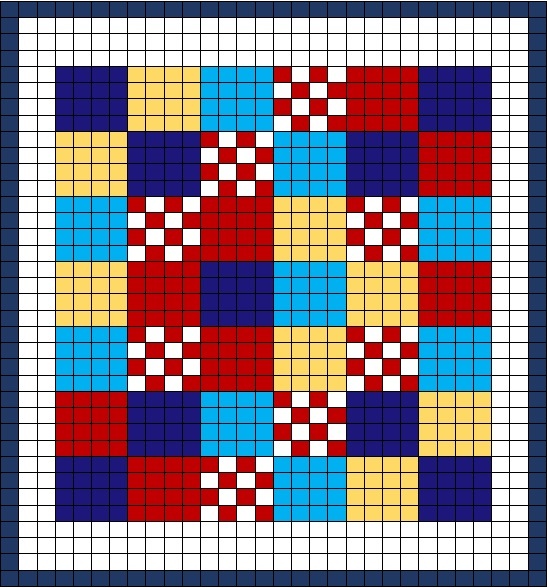 Take the next square, place it over one of the squares, with print sides together, and sew up one side (so all squares are side by side). Continue this method until you have a long strip of 6 joined squares. Make 7 total strips. Now, join the strips together, being careful that your fabric is facing the right direction; hold one strip over the other, with print sides together, and sewing across the long edge. Repeat with all strips. Take one 33" x 4.5" border strip and sew across the top. Take the other 33 x 4.5" border strip and sew across the bottom. Trim off excess. Take one 38" x 3.5" border strip and sew to the side. Take the other 38" x 3.5" border strip and sew to other side. Trim off excess. Next, lay your top panel onto your flannel backing and cut to size. Tip: If your flannel is not wide enough, cut it in half, turn it sideways, and sew two panels together (this is what I did). Place your top panel and flannel backing with the wrong (non-print) sides together. Slowly peel back the flannel to about halfway and spray basting spray between the flannel and top panel. Lay the flannel back down and smooth out, so it's perfectly back in place with no air bubbles or bumps. Repeat on other end of blanket, folding the flannel back to halfway, spray, lay flannel back down. Now you're ready to add the bias. Cut 1 strip of 36" and 1 strip of 44" from each double fold bias tape (2-36" and 2-44" total). Sew the 36" strips across the top and bottom, making sure to enclose all layers of the quilt. Trim excess off the edges. Next, pin a 44" strip on one side, with an excess of 1/2" overhang on both the top and bottom, fold the 1/2" overhang inside the bias tape, and sew the binding in place. Repeat with other side. Last, we'll seal the layers together with embroidery floss! Thread your needle, insert needle through the backing and out through the top layer at the bottom corner of one square. Reinsert needle 1/4" over and through the top corner of the adjacent square (and out the backing). Tie the embroidery floss ends together. Repeat this step several times in different areas. You do not need to "pin" each square, but a few on the top, few in the center, and a few in the bottom. I hope you enjoyed this tutorial! 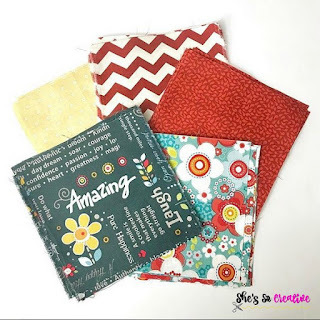 Please feel free to share your finished projects with me on Facebook or Instagram! Thank you for a simple explanation of your pretty quilt. This will be my first attempt at quilting. I've wanted to learn for years but thought it was too difficult without face to face instructions. Can't wait to get started. Wonderful! I'm so glad you find this tutorial helpful! I'd love to see your quilt when it's finished! I've wanted to make a quilt for years but always thought it woyld be too complicated. This tutorial is awesome! I think I can actually do it now. Thanks! I'm so happy to hear that! I'd love to see it when it's done! Thank you for showing me how to do this as I have wanted to learn to quilt for ages and plan to start quilting! You're so very welcome! I'm glad you've found this tutorial helpful! Quite excited to try this out soon. Thanks for making it so simple.